The “Breaking Soybean Yield Barriers” project has completed the third season at the US (Kansas) site. 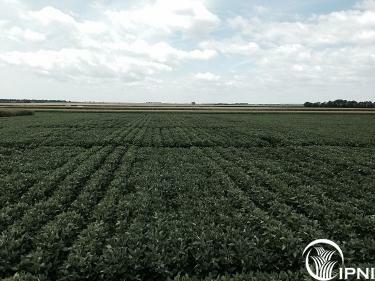 After three growing seasons (2014, 2015, 2016) following the soybean–corn rotation with the same treatment structure and geo-position in the field (plots located in the same place year-after-year), it is possible to analyze yield trends across years. The study allowed us to identify an overall yield gap of 21 bu ac-1 for dryland and of 31 bu ac-1 for irrigated conditions. Analyzing the overall yields (3-yrs) under irrigated conditions the partial factor productivity of the fertilizer (PFPf, seed yield divided by the total quantity of fertilizer applied), was 15 (lb yield/lb fertilizer) for the CF treatment and 17 for the EI treatment. For the dryland environment, PFPf for CF was 17, and for EI it was 18. The PFPf for EI treatment was 16% greater under irrigation, and 8% greater under dryland conditions than the CF treatment. By intensifying production practices (narrow row spacing and increasing seeding rate), each unit of fertilizer added to the system was more efficient in producing seed yield.